The Ukrainian army's positions came under mortar and artillery fire. Two Ukrainian servicemen were killed in the Joint Forces Operation area in Donbas on 28 June, the press service of the 24th detached motorized brigade named after King Danylo has said on Facebook. Militants of the self-proclaimed Donetsk People's Republic were firing with 120-mm mortars and 122-mm self-propelled artillery systems at the brigade's strongpoints near the Pivdenna (Yuzhna) mine from 9.30 to 10.40 a.m. They released 52 mortar bombs and 25 shells. "As a result of the attack, unfortunately two servicemen of the brigade were fatally wounded. To suppressor the enemy fire, units of the brigade were forced to give an adequate answer to the enemy," the press service said. 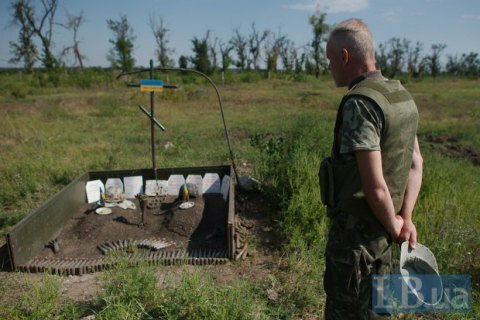 On 27 June, three Ukrainian servicemen were killed and three wounded.